To Start from the Eastern Ave parking lot; From the junction of Routes 100 & 107 in Pascoag travel north on Route 107 for about 0.4 miles. Turn right on Elm St (next to Pascoag Utility), then left on Eastern Ave around the utility. This will bring you to a small parking area next to the trailhead. The Burrillville Bike Path follows the old rail bed of the former New York, New Haven & Hartford RR which operated here from 1872 to 1968. The trail connects the Villages of Harrisville and Pascoag in Burrillville. 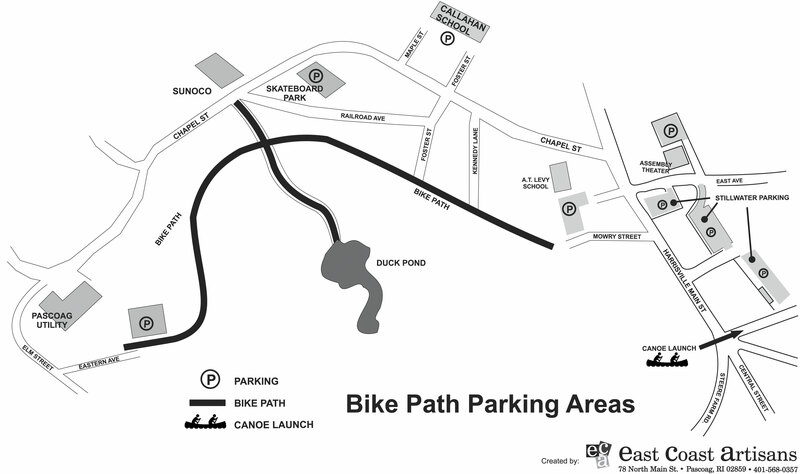 For more information visit; BURRILLVILLE BIKE PATH . Starting from the Eastern Ave parking lot; Follow the paved rail trail east through scrub and woodland. At 0.6 miles a paved spur trail left brings you out to Railroad Ave. Note; Right is a 1/4 mile hard packed dirt spur trail out to Duck Pond. Rough in spots from erosion. Mt bike recommended. The next section travels through a residential corridor before ending after 1.2 miles at Mowry St.